Another day, another recall. This time, a new Tyson chicken recall involves the recalling of nearly 70,000 pounds of chicken strips which may be contaminated with…(oh man) pieces of metal. Considering this is just two months after Tyson recalled 36,000 pounds of frozen chicken nuggets for containing plastic pellets — well, what the heck is going on over there, Tyson? “America’s most dangerous food.” Yikes. 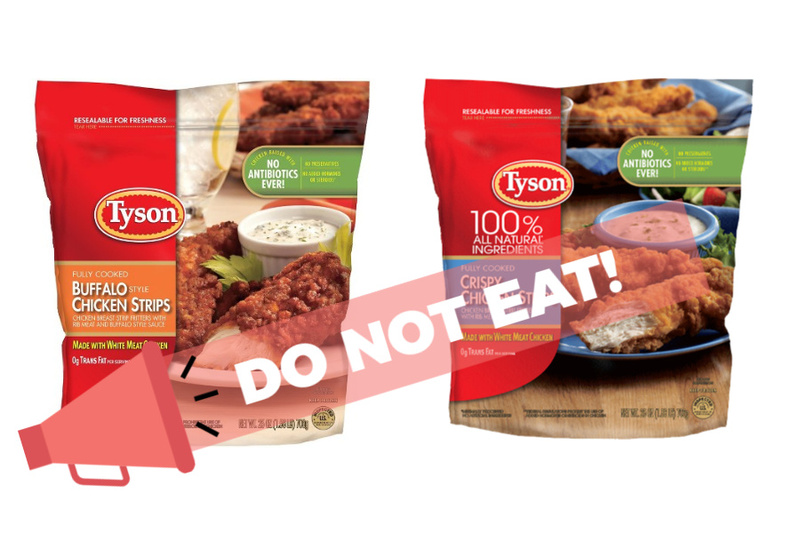 You can click over to the USDA site for more information about the Tyson recall including specific product codes and dates on the recalled packages. But honestly, whenever I see stuff like this I just toss what I have. Not to be alarmist — and there are no known reports of injuries right now — but when it’s marked a Class 1 high-risk recall with “reasonable probability that the use of the product will cause serious, adverse health consequences”, and that probability involves eating tiny shards of metal, well you know…ounce of prevention and all that. Or in this case, 25 ounces of prevention. PS: Parents, be cool. Let’s not use this as an opportunity to get sanctimonious about how you only feed your child free-range chicken raised on organic, hydroponically-grown plant-based products from your own backyard. Parents are all doing the best they can, and even spinach and kale can be subject to recalls.